Scorpa Pranedya Navigation, Inc. of Liberia. Works (Innoshima) of Hitachi Zosen. Works for use in the transportation of re- fined petroleum products between Indone- sian ports and harbors. The tank arrangement conforms to con- ventional requirements applicable to separate ballast oil tankers for the prevention of ocean pollution. In addition, the interior walls of the cargo oil tanks and all inside fittings are coated with epoxy resin paint to prevent the inclusion of interior rust and paint in the product during transportation. The Pertamina specifications are: length overall, 158 meters (about 518 feet) ; length between perpendiculars, 150 meters (about 492 feet) : breadth, 25.80 meters (85 feet) ; depth, 10.80 meters (35 feet) ; designed full load draft, 7 meters (about 23 feet) ; gross tonnage, 10,882 (30,827 cubic meters) ; dead- weight tonnage, 17,723 long tons; main en- gine-, Hitachi B&W 7L45GFC type diesel (1 set) ; maximum continuous output, 6,160 hp; and speed (sea trial maximum), 14.22 knots. General Ship and Engineering Work's hull foreman. Earlier, he had been supervisor of ship repair at Bethlehem Shipbuilding Com- pany. He had previously served with AmShip in various capacities. Early in his career, he was employed by General Ship as boiler- maker, hull fitter and foreman of building boilers, patrol craft escorts and ferryboats. England, and attended school in Lowell, Mass. Artist's conception of new "Broughton II"
Bethlehem Steel Corporation for the con- struction of a heavy-duty cantilever jackup rig capable of drilling 30,000-foot wells in water depths ranging from 100 feet to as shallow as 10 feet. Beaumont, Texas, with a contract delivery date of January 1980. II," is scheduled for delivery in February 1981 at Beaumont, and is available for con- tract. MX 1142 within an hour. They had become experts in its manual computations and maintenance within the day it was installed, he remarked. C. Bernas, in course computations. Francisco, San Pedro and Seattle. 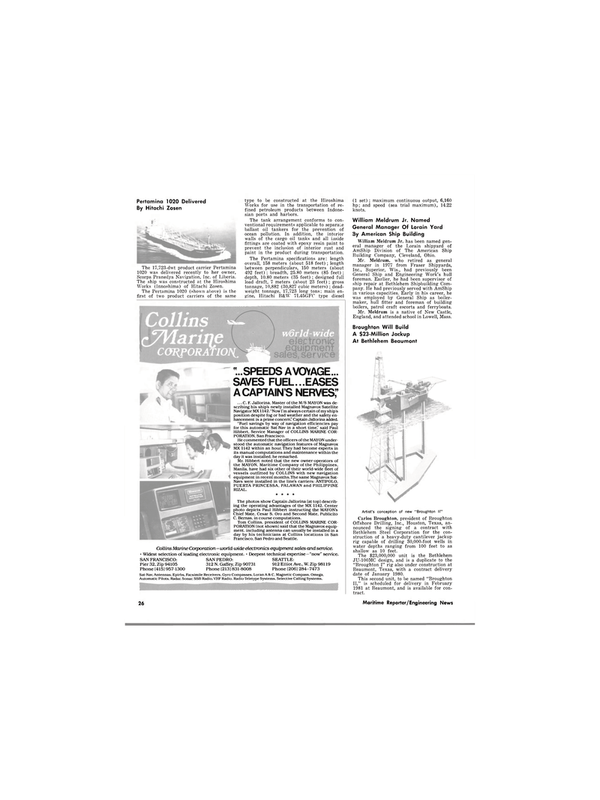 Collins Marine Corporation—world-wide electronics equipment sales and service. • Widest selection of leading electronic equipment. • Deepest technical expertise — "now" service.